About the Book: When Laini Sullivan lands a job designing Nick Pantalone's coffee shop, there are two problems: one, Nick's nephew Joe hates all of her ideas and two, Laini has to admit he's right--she's a disaster at design. Still, she can't risk losing the job. To compromise, Joe brings in help on the project, while Laini continues to bake the goodies that keep his customers lining up. My Review: I haven't read the first two books in this series yet, but I think you can read this book easily without having read the other two. It's a fun lighthearted book that explores the ideas of whether or not God gives us dreams and if we should pursue them. It was easy for me to identify with Laini as she wrestled with that issue. I couldn't help but feel for her as she tried to reinvent herself and found out that she wasn't particularly skilled or passionate about her new chosen career. Sometimes it takes a few tries to get it right, which was a nice reminder. There were a few laugh out loud moments and a few moments when I just wanted to tell Laini to wake-up! But overall I found her a really sympathetic character and I love reading stories with big extended families set in New York. Giveaway: Thanks to the overwhelming generosity of the publisher, I have a whole set of the Drama Queen books to give away! That's right...three whole books! To be eligible to win have a United States mailing address and leave a comment with a valid email address. To double your chances blog about this contest and then leave me a separate comment with the link to your post. I hope lots of you will enter...I think you'll love these books! 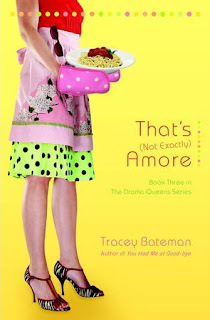 You can read an excerpt from That's (Not Exactly) Amore here! I hope I'm not being greedy,b ut this sounds good! I would love to read this series! Please enter me in your drawing - I love reading books that make me laugh out loud! This look terrific. I've got it on my goodreads list, but I'd love to win it! I also posted about it on my book blog. I checked out all three books in the series on Amazon and they sound great! Please sign me up for the drawing! Thanks! Hi! I found you through fellow blogger 'Daily Mish Mash'. I'm always looking for a good new book or series to read and would love to enter your giveaway. Thanks! I look forward to checking out more of your blog. First of all, I love the book reviews. Amy, are you ever going to review a history book or maybe a fictional history book? Do you want me to send you one to read? I want to play please! I saw your site listed at J-kayes and wanted to come by and look around. This contest is awesome a complete set. I haven't read anything by this author but liked what i read about the books i would love to be added in your contest. I'm also signing up so i can keep up with your site! photoquest(at)bellsouth(dot)net. I've read the 3rd book and enjoyed it; I'd like to read the other 2! I got to your blog from Holly's(2 kids and tired book reviews). I dont enter these giveaways but I love Tracey Bateman and this book is not at my Library. Please enter me. read some books from her and i enjoyed them. please enter my name in the draw. WOW!!! I would love to enter. Great review! Please enter me in the contest! It sounds fantastic and definitely something enjoyable. Would love to be entered! I, too, would love to be entered into this contest. Thanks so much! I love when I laugh out loud reading a book. A sure sign of a great book. Enter me, please. Sounds great I would love to enter into this contest. Please add my name I would love to read the Drama Queens series!